Many of us are aware that in the last days there shall arise someone so powerful and so deceptive that he shall be a wonder man, a supposed man of God. This subject is fascinating and yet surprisingly not well understood. Only those who have studied the last message of the Lord’s Elijah have a good handle on it. Let us delve into this very important subject. Imagine if you will a personality similar to Elvis Presley. Some have said that during the height of Presley’s career his magnetic charm was so powerful that during his live performances in Las Vegas you could literally feel the electricity in the atmosphere once he stepped on stage. Well think of this electricity on steroids! The charisma and charm, not to mentioned the great signs and wonders performed, will most definitely capture the spell-bound multitudes if they are not grounded in God’s word. Let us now look at what God’s word says about this great deceiver. First we begin by quoting the Biblical references that speak of this false prophet. One of the motivating factors in this week’s post is that we heard from a brother in the faith who told us he believed that there really is only the false prophet and the Sunday law system (beast system) and no “666 man” who shall lead the system. Frankly he made some interesting points and thus caused us to hit the books as they say. The prevailing belief that the number “666” is the numerical identification of some other power, is the spawn of the Prince of Darkness, and is calculated to conceal if possible the identification of this two-horn power. Inspiration puts the number on the two-horn beast, and there we must leave it. When the number is finally made up, the servants of God will be able to convince all the “wise” as to just whom the beast symbolizes. First the beast and the false prophet and then the remnant, those that are left, are cast into the lake of fire. Since the “beast” and the “prophet” are special world entities, the remnant (those that are left) represent the rest of the unrepented world sympathetic with the beast and the prophet. The destruction of the prophet, the beast, and the remnant, therefore, is the end of the world — the terminus of the time of the end. Therefore, the miracles are wrought by the false prophet in the sight of the two-horned beast. Therefore, the mystical number “666,” belongs to the two-horned beast and none other. However, we may not conclude that no one before it could have such a number…The two-horned beast is the only one representing a local religio-political government. Therefore, of him alone can it be said, it is “a man.” Thus whosoever shall stand at the head of that persecuting power as described in this chapter, and represented by the beast, is the one who shall bear the mystical number 666. As the doctrines held by the false prophet cannot be fully supported by the Scriptures, miracles are performed to secure the confidence of the people. As the great men and religious leaders declare to the public that the so-called true religion is the truth of Christ, and that the false prophet is His servant, multitudes will fall into Satan’s snare. His false prediction of the coming of the Lord, will be fulfilled by Satan himself as he appears as an angel of light. In the above we truly have a wealth of information to arrive at a fairly good idea who this false prophet is and who he is not. Starting from the top let us highlight the main points. 1) The false prophet is separate and distinct from the “beast”. 2) It appears that the beast is the organizing power and the false prophet is the drawing power. In other words the false prophet is the miracle worker that enables the beast to gain its power, influence and fame. 3) These two powers will be the two main world-wide influences in setting up their religious system. They both appear to be human men (the literal representation of the false prophet and the 666 man). For instance it says, “This beast represents a man who stands at the head of a nation, and whose influence goes far and wide among the kings of the earth. He is further identified by a number — the mystical number “six hundred threescore and six.” Rev. 13:18.” The beast is described as “a man” and “he”. Thus he’s the leader of the end time world religious system. It appears that the “beast power” the religious world-wide system, is described interchangeably with the “man” the 666 man, it’s leader. Nevertheless it also appears that the two are not one and the same entity. 5) The false prophet shall precede Satan in his manifestation of Christ. Therefore the false prophet will not be the false Christ, rather the false preparer of the false second coming of Christ. 6) The false prophet won’t be known as a “Thus sayeth the Lord” type of person, rather a man of miracles to secure the trust and faith of those snared in his deceptions. 7) He will appear as a great healer, thus fooling a great many. But ultimately bringing disease and disaster. In closing, this great deceiver, the false prophet, will indeed play a most important role in the final events. We can see that there will be seven deceiving players in the closing scenes. 1) Satan 2) The 666 man 3) The Beast power (religious system) 4) The false Prophet 5) “great men and religious leaders” 6) the “remnant”, the vast multitude taken and snared by deceivers 7) The Papacy. The above are the players, the team as it were who shall take on the opposing team, the 144,000 and “great multitude” (Rev. 7:9) in the “Great Controversy” the final spiritual battle for the souls of mankind. As we have spoken before we, unlike the world, cannot be on the opposing team when the players take the field. Sure, there will be some “former” SDA who have withdrawn from the church who will be on the opposing team but that will prove disastrous for them. We MUST be among the 144,000 team if we stand a chance on the field in those final events. Let us not forget that it’s good to know these things yet if we as Seventh-day Adventists are not “striving” to be among the 144,000, this will profit us little. The following was written in 1938 as part of the News code items from Victor Houteff. We found this enlightening and hope you are blessed as well . “As most of our people hardly understand what the Spirit of Prophecy means by the statement: “The Lord shall take the reins in His Own Hands” (“Testimonies to Ministers,” p. 300) we are writing the following paragraphs. The foregoing prophetic statement reveals two definite things. First, that the Lord is not now holding the reins in His Own hands, and, second, that at some time He will do so. That is, as God is not now ruling the denomination through its present organization, He must reorganize it. As God’s taking the reins in His Own hands has been demonstrated in times past, none need remain ignorant of the method He will now employ to “perfect His work of righteousness,” nor of the system He will use to rule over His Own. In the days when Pharaoh reigned over God’s people, the Lord did not send a great army, led by a general trained in the school of the world, to set them free, and to give Him a chance to rule over them, but he sent Moses, the simple means, with his shepherd’s rod. To Pharaoh, this appeared so simple, so small, that he paid but little attention to that which was then taking place. Nevertheless, as he saw the leaven working in his kingdom, at times he became convinced that he should let Israel go, but as he viewed Moses’ work, simple as it was, his heart hardened, and he said: “Ha, it cannot be of God, I will not let Israel go.” This was repeated time and again. Then, finally, the blow came by the death of the first born, and there was a great cry throughout the land of Egypt as Israel went out. But as Pharaoh was not yet convinced that God had taken the reins in His Own hands, he and his army went to bring them back. Therefore, God employed the Red Sea as a means to protect His people and as a means to destroy Pharaoh and his army. The Lord will work in no less miraculous a manner now to free His people from being ruled by a worldly organization. He will command the work Himself in the same manner as He did in Moses’ and David’s day. Therefore, as we are now living in the time of the returning of the 144,000, the twelve tribes, it is evident that they will at this time become a kingdom in the hand of the Lord God instead of being ruled by men through a common worldly organization. 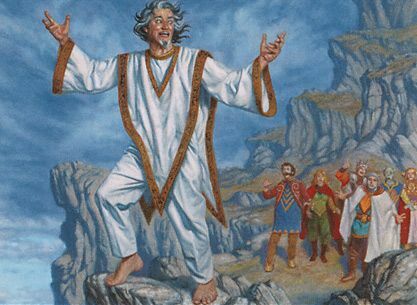 In the days of Moses and in the days of David, when the Lord had the work in His Own hands, He spoke to the people through Moses and through David, and thus He ruled. In like manner will He, at this time, rule the work when He takes the reins in His Own hands. In prophecy, God revealed to Ezekiel the injustice which, in the latter days, our time, would be done to God’s people by their shepherds, and said: “I will set up one shepherd over them, and he shall feed them, even My servant David; he shall feed them, and he shall be their shepherd. And I the Lord will be their God, and My servant David a prince among them; I the LORD have spoken it.” (Ezek. 34:23, 24.) Thus Ezekiel was also told that the present system, an organization of many shepherds, will be replaced by a new one and be conducted by one shepherd instead of by many. The people over whom the Lord is to take the reins in His Own hands, are, of course, only those who shall compose His kingdom. “And they shall teach no more every man his neighbor, and every man his brother, saying, Know the Lord: for they shall all know Me, from the least of them unto the greatest of them, saith the Lord: for I will forgive their iniquity, and I will remember their sin no more.” Therefore, the Lord’s taking the reins in His Own hands is the beginning of the establishing of His everlasting kingdom, just prior to His visible coming in the clouds. Note that the kingdom is set up not after the “days of these kings,” but in their days, and that those kingdoms are to be broken by it. Therefore, although at first, and before the resurrection, the kingdom will not be completed with all its subjects, it will have its beginning before the second coming of Christ. Christ’s Own parable reveals this truth, for He says: “When the Son of man shall come in His glory, and all the holy angels with Him, then shall He sit upon the throne of His glory: and before Him shall be gathered all nations: and He shall separate them one from another, as a shepherd divideth his sheep from the goats: and He shall set the sheep on His right hand, but the goats on the left. It is generally understood that when Christ visibly appears, the nations will die by the brightness of His coming, and thus the wicked will have no chance for either the Lord to speak to them or they to speak to Him. Furthermore, according to the parable, He sits on the throne of His glory instead of sitting on the clouds as in 1 Thess. 4:17. The prophet Zechariah describes the case of the wicked and the conversion of the righteous in the following language: “And in that day will I make Jerusalem a burdensome stone for all people: all that burden themselves with it shall be cut in pieces, though all the people of the earth be gathered together against it. In that day, saith the Lord, I will smite every horse with astonishment, and his rider with madness: and I will open Mine eyes upon the house of Judah, and will smite every horse of the people with blindness. And the governors of Judah shall say in their heart, The inhabitants of Jerusalem shall be my strength in the Lord of hosts their God. In that day will I make the governors of Judah like an hearth of fire among the wood, and like a torch of fire in a sheaf; and they shall devour all the people round about, on the right hand and on the left: and Jerusalem shall be inhabited again in her own place, even in Jerusalem. When this voice shall be heard calling out God’s people there shall be no sinners in His kingdom, neither shall the plagues fall there, for the saints are called out of Babylon because of the sins that are there and because the plagues are to fall upon all there. In Matthew 13:49 is recorded the separation of the sinners from among God’s people, for at that time, says Christ, the wicked are taken out from among the just, whereas, by the voice recorded in the Revelation, the righteous are taken out from among the wicked–the manner of the one separation being the opposite of the other–which fact proves that the Lord takes the reins in His Own hands before the commencement of the Loud Cry of Revelation 18:4. Our danger at the present time does not lie in that which God has said He will do, for He is well able to handle the situation, but the great peril lies in that many of us are in danger of losing out by questioning and criticizing everything that arises in the unfolding of truth, criticizing the work and position of others, criticizing every branch of the work in which they have not themselves a part (“Testimonies for the Church,” Volume 5, p. 690), instead of coming to the help of the Lord. Yes, some will attempt “to dictate even what movements shall be made when the work goes forward under the direction of the angel who joins the third angel in the message to be given to the world.”–“Testimonies to Ministers,” p. 300. Some go still farther by saying to the promised mouthpiece of God, “You are too earnest, you do not interpret the Scriptures in the proper way. Let me tell you how to teach your message.”–“Testimonies to Ministers,” p. 475. The parable makes it clear that through some man Jesus is to reign before His appearing, and that those who refuse to submit themselves to the one whom Jesus has chosen to represent Him shall lose out eternally. “Therefore we ought to give the more earnest heed to the things which we have heard, lest at any time we should let them slip. For if the word spoken by angels was steadfast, and every transgression and disobedience received a just recompense of reward; how shall we escape, if we neglect so great salvation?” (Heb. 2:1 through 3.) “Wherefore, holy brethren, partakers of the heavenly calling, consider the Apostle and High Priest of our profession, Christ Jesus; Who was faithful to Him that appointed Him, as also Moses was faithful in all his house. And to whom sware He that they should not enter into His rest, but to them that believed not? “Feed the flock of God which is among you, taking the oversight thereof, not by constraint, but willingly; not for filthy lucre, but of a ready mind; neither as being lords over God’s heritage, but, being ensamples to the flock. And when the chief Shepherd shall appear, ye shall receive a crown of glory that fadeth not away. We as Bible students know that the two-horned Beast is none other than our beloved U.S.A. We came “out of the earth” so to speak innocent like a lamb, desiring peace, freedom and safety.But just as the Lord showed, we would someday “speak as a dragon”. That day is here. Allow us to go into this. As we have posted several times previously, the middle east situation is getting hot. And this situation is ready to explode as the prophecy must be fulfilled. “Gather yourselves together, yea, gather together, O nation not desired; Before the decree bring forth, before the day pass as the chaff, before the fierce anger of the LORD come upon you, before the day of the LORD’S anger come upon you.Seek ye the LORD, all ye meek of the earth, which have wrought his judgment; seek righteousness, seek meekness: it may be ye shall be hid in the day of the LORD’S anger. The catalyst seems to be Syria. Before we get into Syria, we should look at the prior U.S.A involvements of neighboring countries. Our own country, our leadership under George Bush Jr. began the middle east meddling. Remember “Iraq has weapons of mass destruction”? Nearly all of us bought that hook line and sinker, remember that as well? The dragon began to speak, and what is the original dragon (Satan) known for? Lies. No weapons of mass destruction at all! A sinister pretense. After all the money and innocent lives spent and taken, what was the result? Rioting, more bloodshed and less peace. Then it all was repeated with Libya. Same result. Now, emboldened by the “success” in overtaking sovereign governments, we began to covet Syria? Why? We claim their leader just like Saddam Hussein, is evil and a murdering dictator and we can’t have that! The dragon speaks again. Back to Syria, as we write this the USA has now bombed Syria in selected areas. The premise is that they are stopping Syria from gassing their own people. The dragon speaks again. If any of you have investigated the chemical gassing episodes from Syria, you’ll see that its been an undercover covert operation! Yes, underworld operatives from the globalists who are trying to form a one world system. Syria and all the other sovereign nations, such as Iran, Korea, Russia, and who ever else is not aligned with the Western Block, led by the Rothschilds (Great Britain) and a few other longtime mega wealthy families, will be fair game under their dubious schemes. This “gigantic war” is to be going on while we witness the church purification. The bombing of the holy land is to occur once these middle east countries start to engage in this gigantic war. What we failed to mention so far is that Israel has been bombing indiscriminately Syria, on the pretense that Iran is setting up positions within her to later attack Israel. Iran is Israel’s sworn enemy and vice versa. So once again a sovereign nation is attacked from the outside for alleged wrongs. So it doesn’t take rocket science to see that all the pieces are there. The Lord has put it in their hearts to ““Gather yourselves together, yea, gather together, O nation not desired; Before the decree bring forth, before the day pass as the chaff, before the fierce anger of the LORD come upon you, before the day of the LORD’S anger come upon you”. Everyone of the leaders, including our president is unwittingly going forward with God’s plan! What a time to be alive, on the threshold of the Kingdom! So even though we are very shortly to witness war, bloodshed and destruction, this is all for the purpose of returning His people back to their land. The nations shall wonder and be amazed! This will be the very last war, as we know it. As His word says they shall not learn war any more. The prophesied battle of Armageddon is not a war in the true sense as the popular idea goes. So this final conflict will not be nation against nation, rather the unbelieving world coming against God’s people. This is Armageddon. More of an individual war versus the standard corporate engagement war . This middle east trouble is a necessary conflagration of events to bring about the pre-millenial Kingdom. And this Kingdom is to start there in Israel, a last day protected land where the final Gospel proclamation is to be given around the world–the Loud Cry headquarters. Right now we are seeing war and hearing rumors of war, yet as the Lord says this is not the end. There is a short work yet to be done of which Rev. 7:9 tells us. The first harvest of Rev. 7:1-4 will produce the 144,000 from God’s remnant church today. We know this harvest is brought by the Lord (Rev. 14:14-16) and then from Jerusalem the 144,000 will go out and bring in the second harvest, the great multitude from “..all nations, and kindreds, and people, and tongues..”. These events taking place right now should alarm us. If we are not ready yet, taken our side with the Lord and professed His Truth. Oh, what a heart-broken experience! “Looking forward to this time of deliverance the angel explained to Daniel: “And at that time shall Michael stand up, the great Prince which standeth for the children of thy people: and there shall be a time of trouble, such as never was since there was a nation even to that same time: and at that time thy people shall be delivered, every one that shall be found written in the book.” Dan. 12:1. NOTE: This study is an advance present truth study. If you are not well advanced yet in the Lord’s Rod message, this may be confusing. Nevertheless you are welcome to follow along but if it’s not understood no need to be worried about it. This week the Lord planted the idea to review the King of the North study. Just a few weeks ago, we had an opportunity to give a live presentation to a small group of present truth believers at our home. But upon reflection we realized that this study has so many twists and turns and is not at all a simple one, we need to focus on a more simplistic version, one where someone could print it out and present it to give a more clear view based upon Q and A. Before we begin, this study is more of an “extra curricular study”. Meaning that due to its very complicated nature (not easily discerned) we present it not in a dogmatic way but rather for your consideration. While we certainly believe in our deductions of who currently is and who will be the King of the North, we respect other ideas. If you find the reasoning very clear after this study by all means use it as a study guide because today we as S.D.A as well as D.S.D.A have quite a few differing opinions. What particular circumstances or facts qualify to be considered “King of the North and King of the South”? “After the dividing of Alexander’s dominion, Egypt and Palestine were, as previously seen, ruled first, by the Ptolemies; second, by Pagan Rome (Dan. 11:15, 16); third, by the Dan. 11:22); and fourth, again by the Christians — specifically by Great Britain (Dan. 11:41). These are the only historically and prophetically recorded supersessions involving the ancient lands of Egypt and Palestine. The surrendering of these countries, by one prophetic king to the other, unmistakably identifies “the king of the north” and “the king of the south” from the time of the dividing of Alexander’s empire to the present time, and leaves no room for doubt or for argument . Rome’s (the king of the north’s) entering a second time into “the glorious land” (Dan. 11:41), shows that though, as aforementioned it once took the land from the Ptolemies (Dan. 11:16) it later, in 633 A.D., lost it to the Turks, and in 1919 — “in the time of the end” wholly regained it. So we see that the King of the North must have “ruled” over the “glorious land” and they must have entered it to take possession. This we see has a historical progression 1) Ptolemies 2) Pagan Rome 3) Rome again (Dan.11:22) 4) Disrupted Christianized kings–specifically Great Britain. 2. Does the SOP describe who is the King of the North ? “A Word to the Little Flock,” one of the earliest S.D.A. publications, in which Sister White says: “I saw all that ‘would not receive the mark of the Beast, and of his Image, in their foreheads or in their hands, could not buy or sell. I saw that the number (666) of the Image Beast was made up’.” — p. 19. “Michael is to stand up at the time that the last power in chap. 11, comes to his end, and none to help him. This power…is brought to view in Rev. 13:11-18. His number is 666.” — pp. 8, 9. The above explains that the two-horned beast is the one to whom the number 666 belongs; and that this beast, of “Revelation 13:11-18,” and the “King of the North” of Daniel 11:45, are the same power. Therefore, the nation represented by this particular beast, and the “King of the North,” or the “man” who is to be the head king — of that nation in the time when this “image beast” (the two-horned) enforces the worship of “his image,” whose image is nothing less than the thing he made, are to make a likeness of the religio-political system of the “beast before him” (the leopard-like of Revelation 13:1-10); that is, a likeness of the papal system in the period before the leopard-like beast received his deadly wound. This reference is packed with clues. SOP declares that the King of the North is the same as the two-horned beast. Then the Rod makes a more detailed summary. Notice that the King shall also be the “head” of the nation represented by the two-horned beast (USA) and when is this to be? Clearly “..in the time when this “image beast” (the two-horned) enforces the worship of “his image,”. “when” it is enforced! Let us not let this escape us as it will be helpful as we proceed. Also the Rod notes that only when the time comes for this enforcement will we know who will be the head (ie. specific leader/king). 3. Does the Rod differ from the SOP as to who this King is now and in future? We see that the Rod, unlike the SOP, announces who was ( at that time around 1947) the King of the North –Great Britain. SOP showed that the “last power”, the last future King shall be the USA/head of that nation. But the Rod describes that GB leads before that time. So the simple answer is –no, the Rod does not differ from the SOP. Rather It sheds more light as to current events. 4. Does the Rod identify a transfer of Great Britain to another King of the North prior to the last KON — which is the USA? No, there is no writings that show an identification of any power after the Rod showed Great Britain as the KON. For one thing as we learned, no other power has “ruled” the glorious land since the Rod established the fact in 1947 of GB. The USA definitely has not ruled the glorious land since then. But let us not be confused , somehow the USA will supersede GB after Michael stands up and will be the final KON, this is why we say this is deep and complicated. 5. Hasn’t Great Britain been removed as ruler of the glorious land today? Aren’t the Jews there now the current rulers? Israel land owner ship consists of three entities –the State of Israel, the (JNF)”Jewish National Fund and the Development Authority. An estimated 93 percent of the country’s total land area (excluding the occupied areas of the West Bank and Gaza) is owned by the state or by quasi-state agencies.(www.jewishvirtuallibrary.org). Adding to this is also the Zionist movements within Israel, which is controlled by the Rothschilds as well. For an excellent video explaining these things see the bottom link. Of special note private ownership of the land in Israel is only about 10%. “While private ownership of land is common (mainly in urban areas), most of the land in Israel (over 90% of the land area) is in the ownership of either the State of Israel, the Development Authority (Rashut Hapituakh, רשות הפיתוח) or the Jewish National Fund.” (Wikipedia- Israeli land and property laws). 6. Why does some present truth believers teach that the current KON is USA? We believe that because SOP makes the statement in “Word to the Little Flock” that the “last power” will be the USA/KON, and that the Rod confirms it, we just assume that because we are in the very last days the USA’s time (Rev. 13:11-18) is here. But unfortunately the “whole picture” of all the statements cannot support such idea. GB is still the KON (still ruling Israel) and until she is dethroned, the passage of this title to the USA is still future. 7. If GB is now King of the North, when does it come to its end? Now we can review previous Inspired statements. So adding it all up we see that GB comes to her end at the gigantic war, and then the USA/KON comes on the scene “in the time when this “image beast” (the two-horned) enforces the worship pf “his image”.. In other words GB is dethroned at the gigantic war and subsequently the USA is the final KON per Inspiration’s prophetic fulfillment. let us keep clearly in min d that the Rod gives only one solid time setting as to when the USA/KON will be in power — in the time of enforcement of the image and that cannot be until after Ezek. 9 church judgment. 8. If USA takes over as KON from GB, how is she to “rule” the glorious land, if the house of Judah is established there? We would like to offer some ideas about this complex situation. From looking at this from a whole perspective we see a double application of Daniel 11:45. Let us remember that double applications are a well-known Biblical usage. For instance let us look at Peter in Acts. Today we can clearly see that although Peter said those true words, we know that the primary application of Joel is yet future. During his time the Spirit was not poured out upon all flesh (but a small number among the vast amount of unbelieving Jews) nor was the sun turned into darkness and the moon into blood. Neither was this time right before the “great and notable day of the Lord.” But to those who were in the hearing of Peter it was — truth. So SOP’s application of the KON being USA, should be viewed as secondary and the Rod’s view as primary. GB fits the true application (power of treasuries, ruling the glorious land, coming to his end in Zech.14:2 war, etc.). We as present truth believers know also that SOP did not have the full light on another important event–Ezek. 9. The Rod places it before the Loud Cry as the primary application and SOP places it during the seven last plagues secondarily. Closing summary — As we promised this study is complicated. Yet if we set all the information before us we can see a clearer picture. The King of the North –GB/Rothschilds are just about to come to their end. The world’s financial system will collapse and thus the Rothschilds will no longer be “king” nor have any more rulership of the glorious land. Then the new focus will be the worlds religions. Think about it, a gigantic war over Israel, and GB/Rothschild’s zionist baby is demolished to a large degree. And at this time a shocking event happens world-wide within the Seventh-day Adventist churches (see Tract 14, p.22). Will this not shock and awe the whole world? Will this turn the world’s focus apart from money/riches to God? Of course! Then the USA backed by the 666 man and the false prophet shall set up to fill this vacuum. But even more importantly the 144,000 take the scene and Joel’s prophecy comes into FULL primary application! The “Great Controversy” indeed! Oh what a time to be alive! All these things are about to take place. “As the storm approaches, a large class who have professed faith in the third angel’s message, but have not been sanctified through obedience to the truth, abandon their position and join the ranks of the opposition. By uniting with the world and partaking of its spirit, they have come to view matters in nearly the same light; and when the test is brought, they are prepared to choose the easy, popular side. Men of talent and pleasing address, who once rejoiced in the truth, employ their powers to deceive and mislead souls. Some may ask — why is this reference so important? Precisely due to the fact that the S.D.A misinterpret it as far as the timeline and who exactly is the “large class” it describes. Let’s look at the S.D.A point of view often taken. When they read it they allow it to fit the long time well-known denomination understanding of end time events. The large class are active S.D.A who have “turn coated” against the faithful remaining church members who still are obeying the Sabbath, when the heat is on and the image is forming. This all comes to a head when the “test comes” ie. the actual set up of the Sunday Law takes place. The former faithful now go against the faithful in the courts and effectively set them up for penalties/ persecutions. This narrative is well-known within S.D.A circles. The promoters of this idea, of course do not have the Elijah message knowledge and skip over the very important fact that the message tells us that all unfaithful active S.D.A at the time of the church judgment (Ezek. 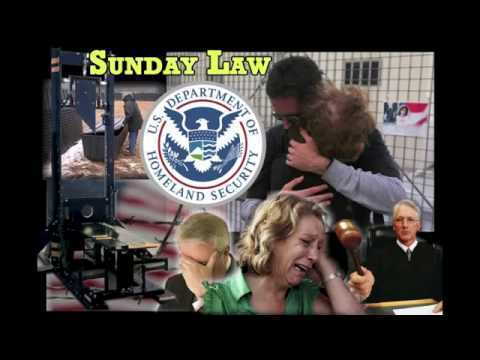 9) –will no longer be on earth to witness the Sunday Law! As well-known, the current leaders promote the “shaking” as the time when the Sunday Law develops and only those who stand firm and continue to go to church on the Sabbath, will be right with God. Sadly all this is not true because the SOP reference applies to the “Great Multitude” or AKA “Second Fruits” who are those who come out of Babylon (false doctrine churches) and decide to keep the Sabbath. The large class who go against them and “have professed faith in the third angel’s message” are the inactive S.D.A and who basically quit going to church for their own justified reasons. As the “Blue Sunday Law” is to be enacted by Satan’s own will, not by God’s, then such a method to purify the church would not only be contrary to every inspired statement but also to Satan’s determined purpose, for his aim is not to bring the tares and then pluck them out, but rather to choke out the wheat by their continued presence. Neither is his intention to fulfill the prophecies, for that is what he would be doing if he should enact blue Sunday laws, but rather defeat them. Therefore, if the church is to be purified by Satan’s laws he would be doing the work which God has assigned to His servants and which He is to do Himself. We know that the message tells us that all who shall embrace the fourth angel’s message as it joins the third angel’s , the final Gospel proclamation that is to lighten the whole world, shall finally make it into the pre- millennium kingdom in Israel (see SC, vol. 9, no.1-12, p.15) , then it appears that despite being put in prison, the Gentiles shall be freed by the hand of God and taken out. “..if we voluntarily stay away from the church services, we lay ourselves open to the charge of being offshoots from the body, and at the same time forfeit the opportunity of coming in contact with the congregation. Ah, the ramifications of this is very widespread! Take for instance the literally thousands of “Reform S.D.A” or the “Home S.D.A” or the myriad of other S.D.A who often call the church–Babylon. They have basically left the church due to the numerous “abominations” and doctrinal differences done within her today. These are they who shall have no right to claim “an inheritance in the Denomination”! This will be devastating in the end! They look from without at what could have been – a part of that glorious number (144,000) formed from the very S.D.A church they abandoned! Let us be clear the Lord’s Rod message DOES NOT advocate leaving the mother S.D.A church. The Lord will separate the wheat from the tares, not us. One of the most insidious tricks Satan uses today is to fool even a few “present truth” believers to stay away from the church. The reasons are that just like some of the other abandoners, they think that the abominations are too great and they can just “coast in” with their knowledge of the Lord’s Rod and yet not have to remain at their post of duty! Wow, what deception indeed! In closing my beloved, make no mistake there are only three courses we can take right now, as members of the S.D.A church. “The knowledge of present truth, which the five foolish virgins possessed since 1844 is the judgment of the dead, and was the only oil in their lamps. When the judgment of the living commenced, and the “cry was made,” they were found without this extra oil in their vessels; they had neglected their Lord’s command: “Watch therefore, for ye know neither the day nor the hour wherein the Son of man cometh.” Thus when the wise ones started out to meet the bridegroom the lamps of the foolish went out, for, the judgment of the dead had passed. Therefore, it was present truth no more, and thus they were left in darkness. At the beginning of the judgments of God they saw their mistake and rushed for the ark of safety, but it was beyond their reach for they knew nothing of the message, and by the time they acquired it (filled their lamps with oil), there had been a delay, the angel had passed “through the city, through Jerusalem,” thechurch — the sealing was finished, and probation for the church had closed — the door was shut. Time is short and soon the storm indeed will be speedily approaching, let us choose the safe and secure way, the number 1 way.